For some of us, war never ends. 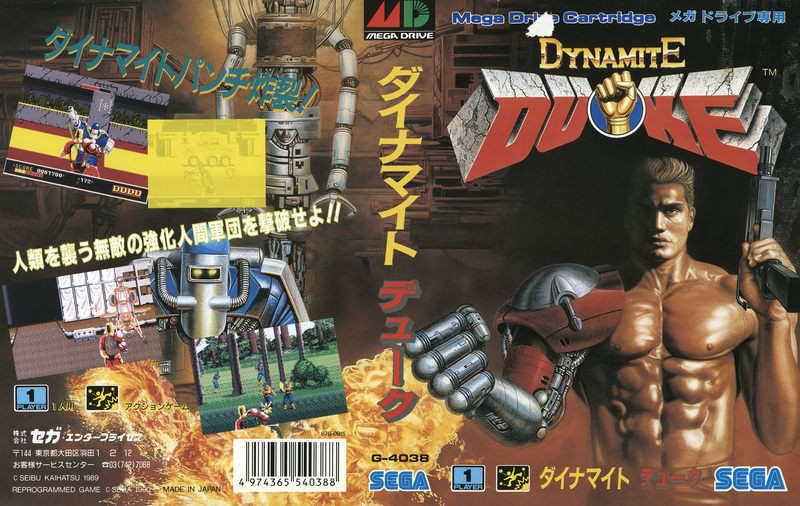 Not to be confused with the cartoony beat-em-up Dynamite Dux, Dynamite Duke is actually the final entry in Seibu Kaihatsu’s shooting trilogy that began with Empire City: 1931 and Dead Angle. 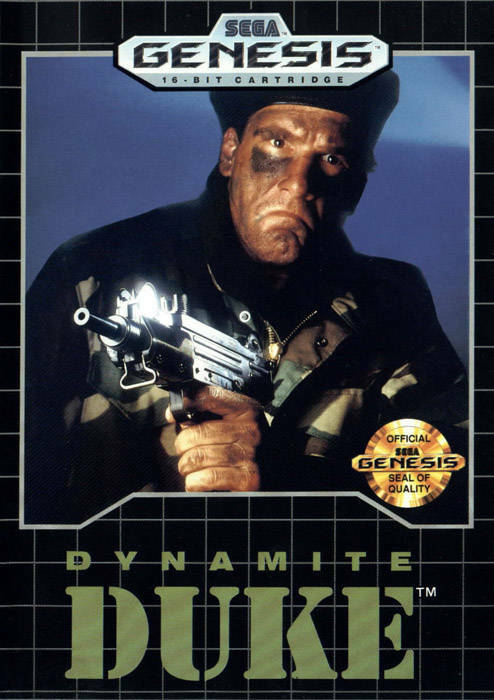 While the latter games had you gunning down mobsters in the 1930s, Dynamite Duke takes place in the future with you playing as Colonel Duke Rippem, a one-man army against the mutant soldier hordes of Dr. Ashe. 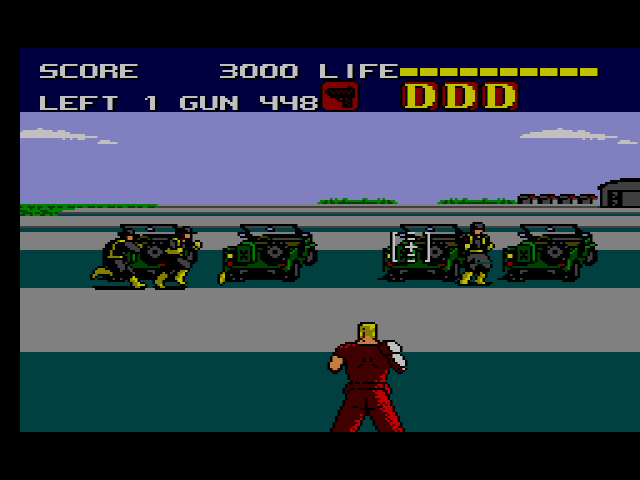 When the game begins, Duke is right up in front of the camera, gun held out, ready for war. You control Duke and the crosshair with the D-pad and fire your weapon with ‘A.’ As in Dead Angle, you can’t fire your weapon and move at the same time (unless you have a certain power-up – more on these later). Since the entire screen is littered with soldiers and helicopters and turrets shooting at you, you’ll have to shoot and move as quickly as possible. 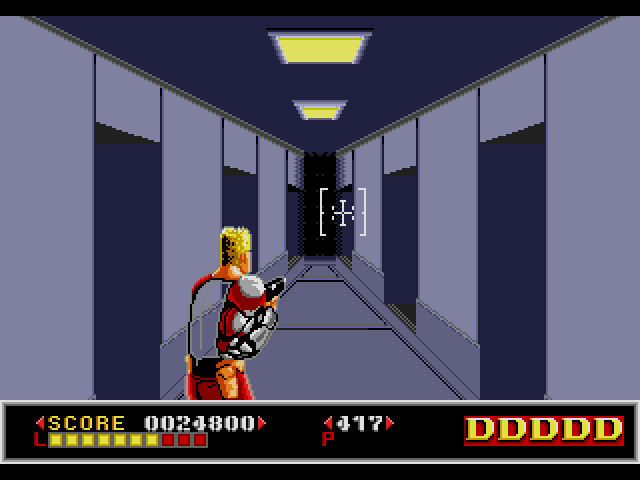 Unlike the spectral protagonist in Dead Angle, Duke is able to sail across the screen with zero slowdown. If there’s too many bullets heading his way and not enough time to move out of the way, he can also duck to avoid them. The best strategy is the simplest: fire like crazy where there’s lots of enemies, hope you kill most of them, then move to a different part of the screen, fire some more, and so on until you’ve reached the end of the stage. That’s right… drift into the crosshair. 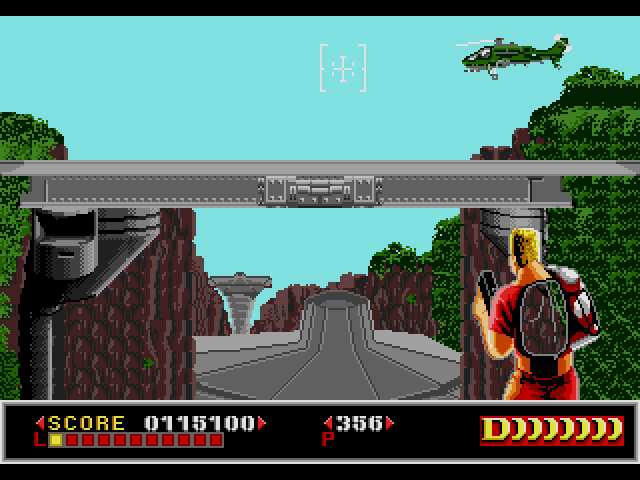 Each of the game’s six levels is an automatic scrolling affair, where Duke is carried along by the wheels of fate. All of them have the same objective: shoot until your fingers bleed or until Duke is sprawled out, bullet-ridden on the ground. For as fun as Duke is to control, the levels themselves are flavorless slabs of grade-F meat. Laboratory! Air Field! Woods! These are both the names of three of the levels and what you can expect to see in them. But forget the level design, yeah? Let’s just shoot crap up. 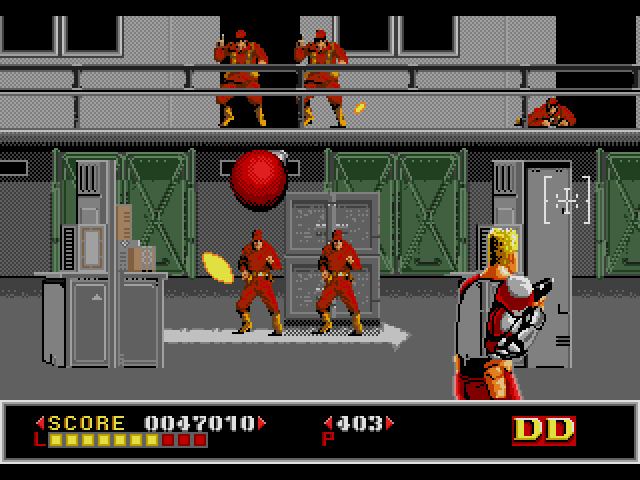 Duke’s machine gun has a limited amount of bullets, but more bullets can be found by shooting random objects around each of the levels. Duke can also find a magnum and bazooka, both of which have limited rounds but are considerably more powerful. The Full Auto turns the machine gun into a fully automatic assault, allowing you to run across the screen without pressing ‘A’ to fire. Duke can handle a gun, all right, but can he put up his literal dukes and have it out? 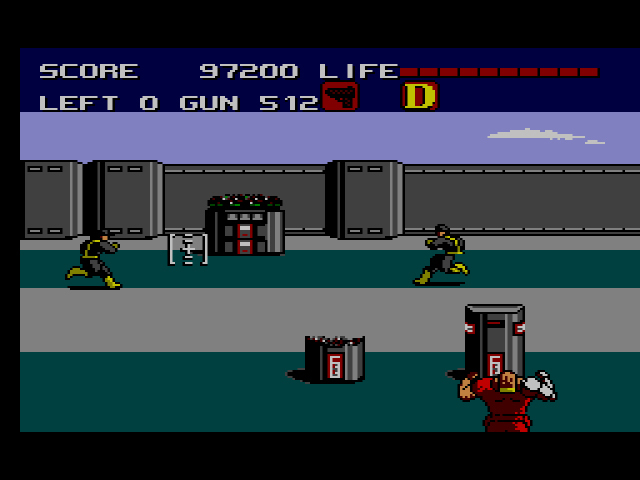 Several of the boss fights in the game ditch guns for fisticuffs. While it’s amusing to see this on-screen spectacle, this is some seriously sloppy man-on-mutant brawling. For every hit you dole out, you’ll absorb two or three hits, even if you think you’re avoiding their attack. This is where the Dynamite punch comes in. By holding ‘B’ for a couple seconds, you’ll unleash a powerful uppercut that will take a chunk of health off the boss. The only way to fight. Not even mutants in thongs can withstand the Dynamite punch. Dynamite Duke‘s run-and-gun antics will seem difficult at first, but once you get the hang of shooting and dodging, you can complete the game in about thirty minutes. There’s additional difficulty levels in the Options menu if you want to get crazy, but otherwise, ol’ Duke doesn’t have much replay value. Duke Rippem treads his own explosive path. 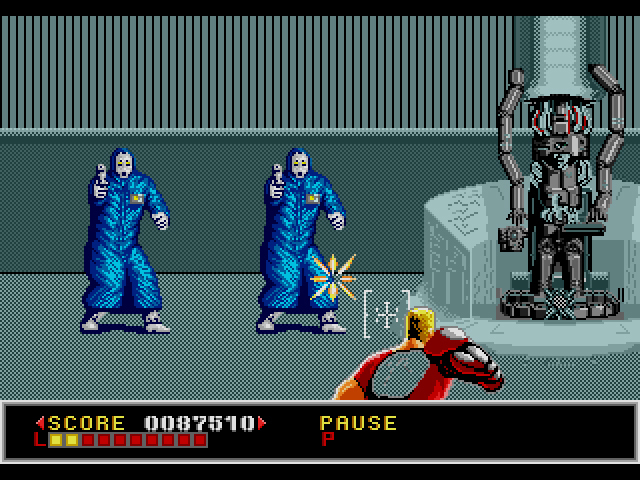 One minute, you’re having some laughs, beating up a robot warrior and destroying laboratory equipment. The next minute, the game’s over, and Duke’s left you for bigger and better missions. Your time with him was memorable, but after some reflection, you realize there’s nothing under his sweaty exterior. Walking in Duke’s destructive shoes is fun for awhile, but lingering there will leave you with smelly feet and a hunger for more. Relax, Duke, it’s only a simulation. 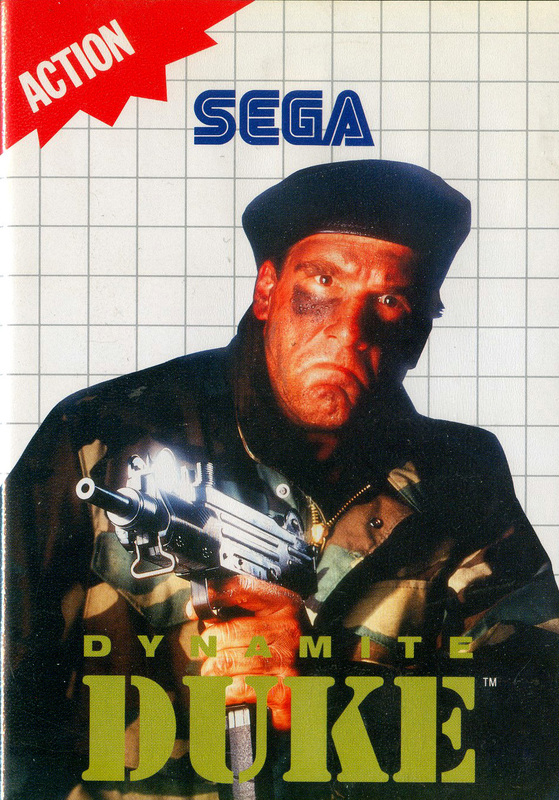 If Dynamite Duke for the Genesis showcases Duke Rippem in his prime, this Master System port casts the Duke who’s one step away from retirement. He’s not as quick to move across the screen. Bullets take off more damage than they used to. The levels take longer to complete. Duke might look as ripped as he ever did, but beneath that muscular exterior, lies a middle-aged man in search of a nap. 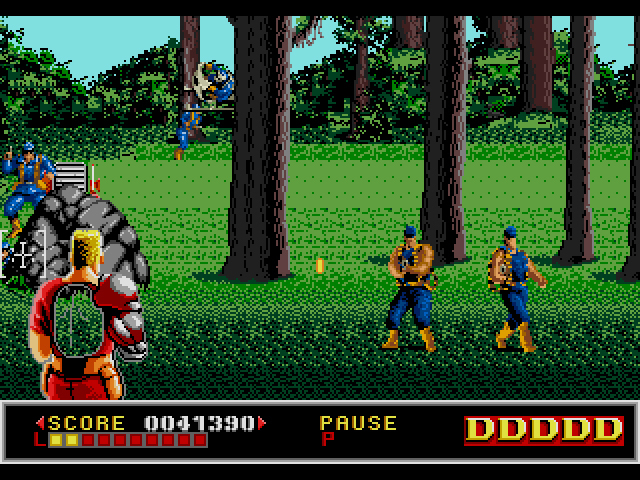 The game tries to account for 8-bit Duke’s limitations. There aren’t nearly as many enemies per level, and the ones that are there can be picked off easily. 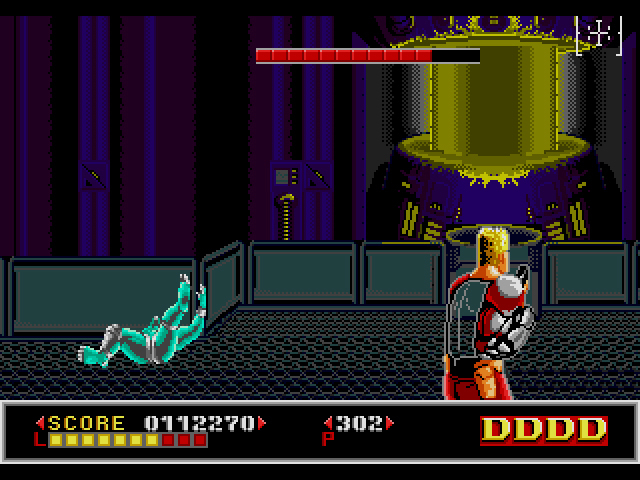 You’re even given an extra life in each stage, something the Genesis version did not provide (although you do have only two continues as opposed to the Genesis’ five). Even with these provisions, Dynamite Duke for the Master System is a lesser port. Old Duke just isn’t as fun to control, and the level design is even more unappealing here than on the Genesis. Duke will always be a legend of his time, but as with all legends, he should be remembered as he once was, not what he became. Next Article New and Improved Games Lists! I really liked this game. But it was far too easy. Beat it on a rental. It’s a fitting endpoint to the formula for these games. I really liked the first person battles with the bosses with the punching. It changes things up from the shooting stages, but most of the boss patterns aren’t too hard to figure out. The arcade had pretty good graphics for the time. The Genesis game is a fairly good port. You mean you didn’t play it on the Super difficulty?! Thanks Sut! It’s definitely a trashy Cabal clone, but it’s still pretty fun, if only for a short time. 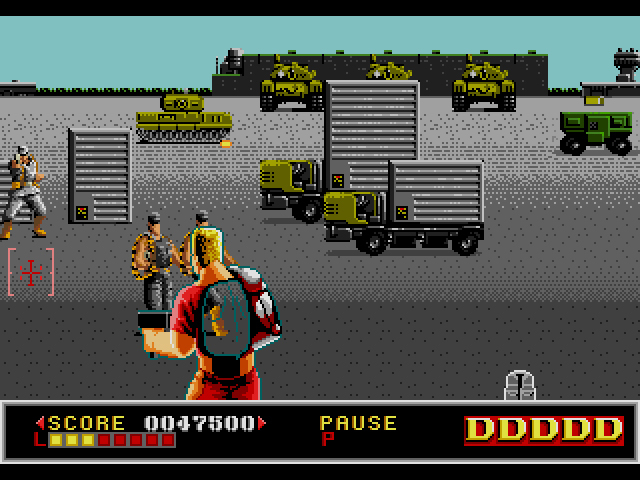 Yeah, I’ve wondered how this game compares to Cabal on the NES, or even the NES port of Operation Wolf. Sadly, I’ve never played this, nor have I even seen it in the wild, though I was always curious about it. Funny how we get the generic “G.I. Joe” inspired cover art, instead of the glorious Dolph Lundgren Japanese art.